Our goal is to install Lubuntu on VirtualBox from a custom OVA appliance. Inside the OVA file is a compressed instance of the Linux Lubuntu distribution that I created on my home machine. On my home machine I installed a Linux distribution called Lubuntu in a VirtualBox virtual machine. I configured this copy of Lubuntu so that it was (relatively) easy for students to use in my course. Then I bundled it up in an OVA file and put the OVA file on Google Drive. This is a dropdown in newer versions of VBox. Watch it quickly install itself inside VirtualBox. For more details, see the install section below, particularly the note about network error on first opening the appliance. Once this Virtual Machine is installed, it will contain a copy of my customized version of Lubuntu Linux. You can run this OS and use it as the primary place where you do your work throughout the quarter. You may, of course, be on a Mac, or even on Linux. None of that should matter so long as you know the difference between the host machine and the guest machine. In other words, the host will usually be Windows, but could be a Mac or a Linux machine. But in this case, the Guest will always be Pristine Lubuntu. Lubuntu is a Linux distribution. It can be the primary operating system on a computer. In other words, you could, but almost certainly should not, delete Windows and install Lubuntu in its place. But in our case, will keep the host OS the same, and use VirtualBox to run Lubuntu as a Virtual Machine (VM). The host is a "real" machine running an OS like Windows, the Guest is a Virtual Machine which in our case is running Linux. VirtualBox should be installed on all the machines in N252. Nevertheless, before doing anything else, confirm that you have VirtualBox installed. NOTE: On the N252 school machines you may not be able to install or update VirtualBox. In that case, you can ask me for help and we can ask IT to install it. If you have Admin privileges, you may be able to install VirtualBox, but this is not always guaranteed to be a permanent solution. NOTE: I greatly prefer that you use the school machines rather than your laptop. I simply cannot see the text in most student laptops as it is too small. Also, you will get much, much more out of this class if you learn to use Git to move code between your laptop and school machine, rather than doing all your work on your laptop. In terms of getting a job, learning Express, React and ES6 are the most important aspects of this course. But close behind them is gaining a solid understanding of Git. In some classes, I may insist that you work on the school machine. Once you are reasonable certain you have VirtualBox installed, then you should download the big Pristine Lubuntu OVA (virtual appliance). The link below requires a bit of patience. Select it, and determinedly click through the options until the download begins. Once this big 3 or 4 GB OVA file is downloaded, consider moving it to some save location such as your Documents/Data directory. Our default, preferred version. If in doubt, select this version. The file you download should have an OVA extension. NOTE: You should select the option to reinitialize the MAC address. Every machine on the Internet needs a unique Mac address or conflicts may occur when using the network. If you forgot to click this option during install, you can do it later by choosing Settings | Network | Advanced from the VirtualBox menu before you launch your Lubuntu VM. (If necessary, close the VM, then select this menu option.) There is a blue doo-hickey that you can click to reinitialize the address. MAC addresses are meant to be unique. The DNS servers set up by the college allocate IP addresses based on the presence of a MAC address. If two VMs have the same MAC address, then the machine that logs on first will get on the Internet, but the second machine will usually get errors when it tries to access the Internet. After the file has been imported via the simple wizard and the MAC address is updated, select the new item in VirtualBox and choose Start from the menu or icon bar. NOTE: If you get an error about the network, this is usually because the network card on the system where I built the VM is different than the one on your current machine. You should be able to select all the default options to solve the problem. Just keep hitting enter, or clicking OK, or something similar, until the problem is resolved. NOTE: You may get an error about the audio system when installing the OVA. You can ignore that message. NOTE: If you get a warning about USB drivers, this usually means that the Virtual Box Extension Pack is not installed. This could be due to a mistake by the Bellevue College IS department. If you have the rights, install them from here. To install, just double click on the download. If all else fails, go to Settings | USB for your VM and turn USB off for now. Our Pristine Lubuntu image is set up to have about 6GB of RAM. This is fine at school since we have 32 GB of memory on these machines. When using this image at home or on a laptop, however, you may need to change this setting. To do so, select Settings | System | Motherboard | Base Memory. Many machines have 4 GB of memory, so setting the memory to 2048 is acceptable, if a bit painful slow at times. You probably need at least a browser and WebStorm, so open them, and keep everything else closed. If WebStorm is proving too demanding, then choose Geany instead. It is a very good, very light weight editor. I believe, but am not sure, that Visual Studio Code is also more light-weight than WebStorm. Don't close Lubuntu by clicking the X icon at the top left or right of the VM window. Instead, use the On/Off switch at the bottom right hand corner of the window, or choose Logout from the Start menu located in the bottom left of the VM window. Don't try to put your computer to sleep while the Lubuntu VM is running. Instead, shutdown the VM and then close your laptop or perform some other action that puts your machine into a sleep state. It may appear at times as if you are getting away with violations of the above two rules, but eventually these bad habits will catch up with you. In particular, these actions can cause your local copy of your GitHub repository to be corrupted. Believe me, you don't want that to happen, particularly if you are new to Git. You don't want to close your VM with cancel (X) icon any more than you want to turn off your computer by pulling its plug. Putting the machine to sleep while the VM is open should in theory work, but in practice it simply does not work very well. NOTE: Some very fast, well configured laptops with lots of memory are perhaps more forgiving when you put your machine to sleep with a VM running. That may or may not be the case for you, but please don't turn to the student next to you, who is perhaps running a much less powerful and stable machine, and tell them that there is no harm in simply closing the laptop lid without first shutting down your VM. In general, just follow my advice and shutdown your VM before putting your laptop to sleep. It is important that you regularly update your instance of Lubuntu. Don't just ignore messages to update the OS. There is a first time for everything, but I have literally never had an update of Lubuntu put my machine in an unstable state. Or at least I cannot recall such an incident. if JsObjects is properly installed, I have a command line script called update-all that will ensure that everything on your machine is up to date. Just go to a Bash window (the command line) and type update-all and press enter. You may get a prompt during the update, but you should be able to choose the defaults on those occasions. The files that are being updated are stored in ~/npm. In particular, see ~/npm/bin. Note: The syntax ~/npm is shorthand for /home/bcuser/npm. Make sure you have installed the VirtualBox Extension Pack. To check, go to File | Preferences | Extensions. Make sure virtualization is turned on in the bios for your machine. Most machines come with the virtualization turned on, but when it is not, you usually have to go into the Bios and muck about in unsettling ways to get the matter sorted. See the link in the first sentence of this paragraph to learn how to proceed. As I say, you will likely feel a bit uncomfortable, but in the long run it is no big deal to turn it on in those infrequent cases where it is not already enabled. 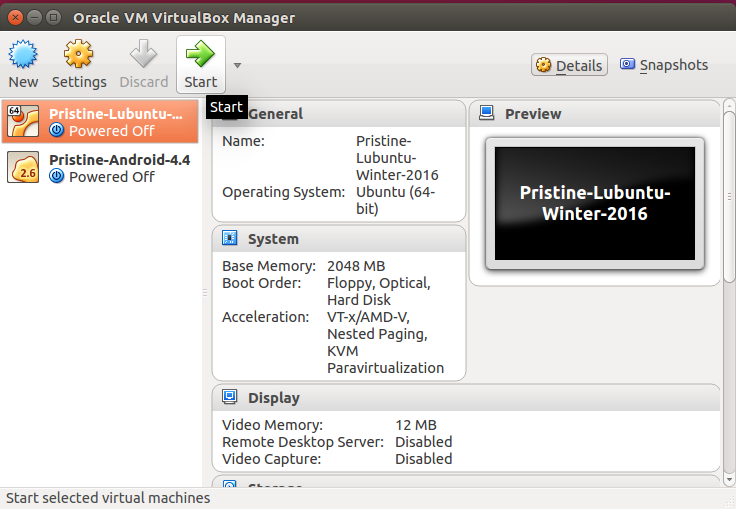 I install the VirtualBox Guest Additions on the Pristine Lubuntu VM, but after updating VirtualBox itself, you may need to make sure you have the guest additions set up properly. If in doubt, follow the link in the previous sentence and get on top of this subject. It's important and not very complex. Shutdown or reboot Lubuntu regularly and before putting your machine to sleep. If things are whacky, shutdown Lubuntu and reboot Windows. Again, be sure you are running the latest version of the Guest Additions. 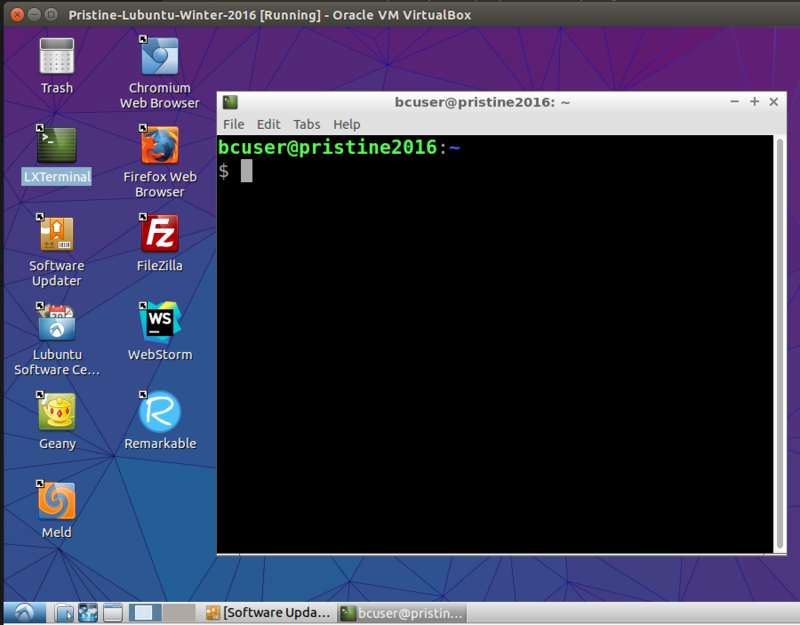 Create a screen shot of VirtualBox running Lubuntu as a guest OS on your system. Attach the image to your assignment when you turn it in. Normally, I expect to see the Windows desktop, then VirtualBox, and inside VirtualBox, a copy of Lubuntu. Note: Please do not embed the image in a Microsoft Word DOCX file or any other document. Simply attach the raw JPG or PNG file directly to the assignment. Sometimes I need to see details in your images, and embedding the image in a document can compress it and make it hard to see. Note: If VirtualBox has the focus on your desktop, then any keystrokes you make will go to VirtualBox, not to your Windows desktop. As a result, you can't press Ctrl-PrtScrn with VirtualBox focused and expect it to work the way it does when other applications have the focus. One solution is to use the Windows Snipping tool or follow one of these suggestions. You can also usually create screen shots in Lubuntu and submit them. But the screen shot will be in the Lubuntu file system, not your Windows file system and won't include your Windows desktop, which I want to see in this particular assignment. Normally I don't want to see the Windows desktop when I ask for a screenshot, but this time I do. With the possible exception of screenshots, and configuring VirtualBox itself, it is usually best to do all your work inside the VM. This includes browsing, email, downloading, etc. Just go ahead and maximize Lubuntu so that it takes up your whole screen (Right Control - F). I find it confusing to keep switching back and forth between Linux and Windows. Lubuntu is more than powerful enough to allow you to do the work for this class. It can be a little unstable at times, but if you treat it gently, it should meet your needs. Start by clicking the Start button at the bottom left of Lubuntu Desktop. 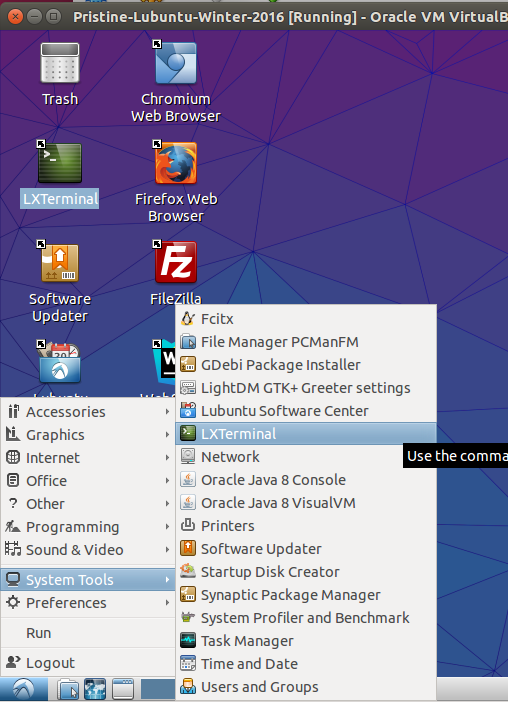 Select Start | System Tools | LXTerminal. We can see the Lubuntu desktop. We can see some icons. And most importantly, we can see the bash shell (the terminal) open on the right hand side of the desktop. The shell is open on the home folder. The user is bcuser and the machine name is pristine2016. What you see is probably not exactly like this, but you should at least be looking at something vaguely resembling this screen shot of the bash shell. Choose Settings | System | Acceleration and confirm that VT-x | AMD-V is selected. You can confirm this at run time by selecting Machine | System Info. 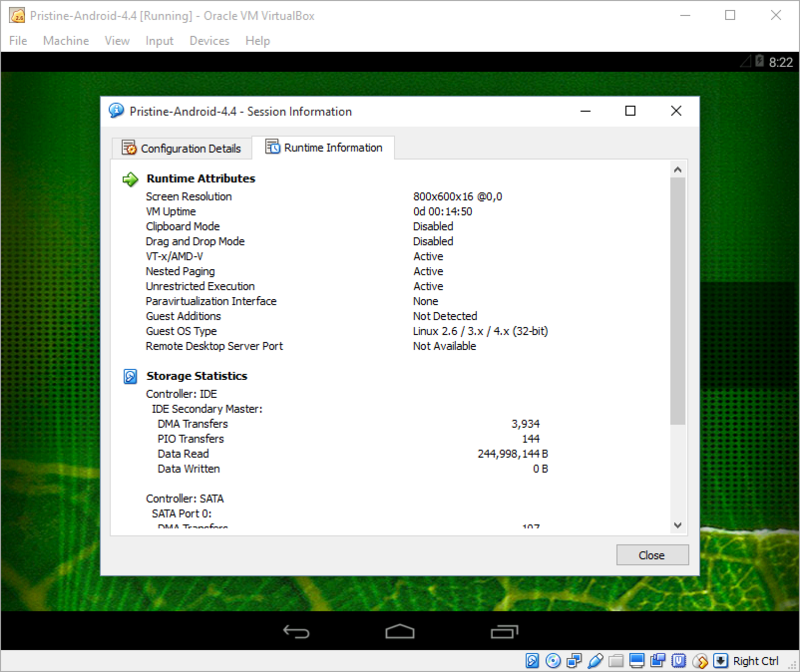 If you don't have virtualization help from the processor then your VM will either be very slow, or not work at all. In the screen shot shown below, I'm not running Pristine Lubuntu. In this screenshot, I just want to show you the Session Information dialog, not the Lubuntu desktop. In your assignment, however, I want to see your instance of Pristine Lubuntu running. In other words, don't use the picture below as a guide. Your picture should look quite different from this. I have been setting the base memory for our VM's too low. Instead of setting to 2048 MB, let's try setting it to 4096 MB (4 GB) or even 6144 (6 GB). NOTE: I'm talking about the settings for our school machine, which has 32 GB total memory. Using up 4 GB for our VM is not excessive on such a machine. On your laptop and home machine, however, 2 GB might be the right number, depending on how much memory is available on your machine. In VirtualBox, select Settings | System | Motherboard | Base Memory. Set it to 4096. Restart your VM, open the bash shell, type free -h. You should see about 3.9 GB available.